5 Best Shower Chairs and Benches 2019: Improve Stability! If you’ve decided to invest in a bath and shower chair, you already know how tricky it can be to navigate the bathroom safely. Bath and shower chairs are designed for people with balance and mobility issues. These chairs are waterproof and they’re secure enough not to tip over when you’re sitting down or standing up. There are many different models to choose from. So how do you know which chair is right for you? Some bath and shower chairs are designed for comfort. Others are made to be portable. Getting a bath and shower chair can make a considerable difference in your everyday routine. If you don’t have to worry about injuries, it’s easier to relax and enjoy your shower or bath. You can also get done faster and move on with your day. But before you choose a chair, you have to take some important questions into consideration. The chair has to be suited to your physical abilities as well as the layout of your bathroom. There are models designed for people with different needs and circumstances. 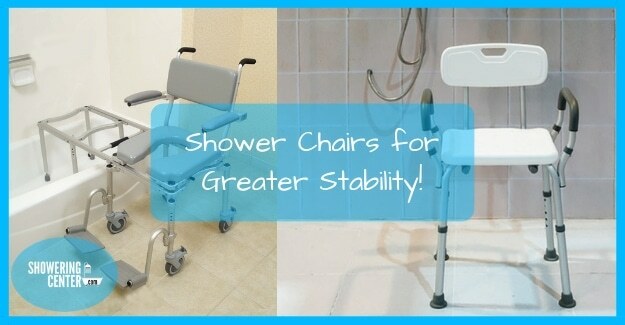 We have prepared a selection of stable and long-lasting bath and shower chairs. One of these could be the best choice for you. This chair is a great choice for both tubs and shower stalls. On the ground level, the leg spread dimensions of this chair are 15.5" x 14.5". You need a level area of 17” x 16” to use this chair safely. The rubber feet stop it from sliding around, which makes it safer for those who use a cane or have difficulty standing up. If lifting heavy objects is a problem for you, this could be the best chair you can choose, as it only weighs four pounds. You can take it with you when you go on vacation. But is it safe to use such a lightweight chair? Dr Kay’s Bath and Shower Chair is made of anodized aluminum. This means it resists corrosion, and it’s sturdy in spite of the light weight. Anyone weighing up to 250 pounds can use this chair safely. Again, the rubber legs keep it in place in your bathroom. The legs are flared, which means that the base is very wide. Hence, you don’t have to worry about the chair toppling over when you sit down. Now, we’re getting to the most important feature of this chair: the height is adjustable. 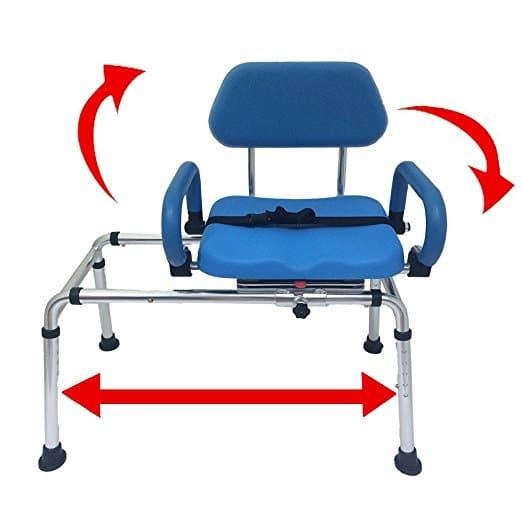 Chairs with adjustable height are the best option for many users. Later in this article, we will cover the ideal height for your shower chair. You can adjust the Dr Kay chair to suit your own height. The lowest and highest seat heights are 12.5” and 18.5” from the ground. Adjustment is easy, and you don’t have to use any tools. The platform you sit on is curved, which guarantees extra comfort. You also don’t have to worry about water gathering underneath you, as there are four drainage holes on the seat, as well as a handle on each side. You might find that the seat isn’t wide enough for comfort. The seat dimensions are 17"x10.5", which is not ideal for people with a large body type. You may prefer an option with backrests and armrests. There’s one more consideration. If you have an uneven shower floor or tub, this isn’t the best chair for you, although it is very stable on even ground. This might be the best bath and shower chair for you if you want a chair that you can pick up without assistance. The adjustable height makes it a good option for tall people, but the seat may not be the right size for some. If getting into the bathtub is a challenge for you, you should consider getting a transfer bench. Instead of stepping into the tub, you can sit on the swivel seat, and then slide safely over the wall of the tub. 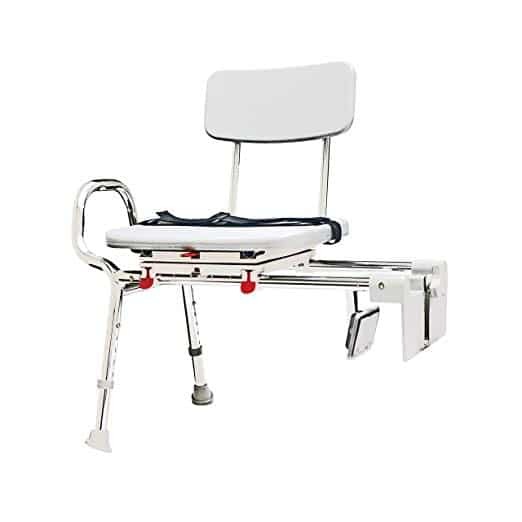 Platinum Health’s Carousel Sliding Transfer Bench is a top-grade bench that sees use in hospitals and retirement homes. First, it’s important to acknowledge that this chair is a serious investment. However, it is both versatile and extremely comfortable, so you may find it to be worth it. You may be wondering about installation. This chair is easy to put together, even without tools, and you can put it together within five minutes. If you opt for this chair, you won’t have to remodel your tub or shower in any way. The only alteration you need to worry about is the shower curtain. Getting a special shower curtain will keep your bathroom floor dry, decreasing the risk of slips and falls. When you sit on the padded swivel seat, you can rotate it 90 degrees and then activate the sliding function. This is easy to do by yourself, though people with decreased hand strength may need assistance. If you have a tall or exceptionally narrow tub, you can order an extension kit from Platinum Health. This is an exceptionally comfortable bath chair, and it is a good choice for people who have balance issues when sitting. If you prefer to have long baths and showers, this might be the best option for you. There is a removable backrest, as well as padded armrests. You can also use the seatbelt to keep from sliding forward. At the same time, the armrests pivot, so you can move them out of the way when you’re about to get up. 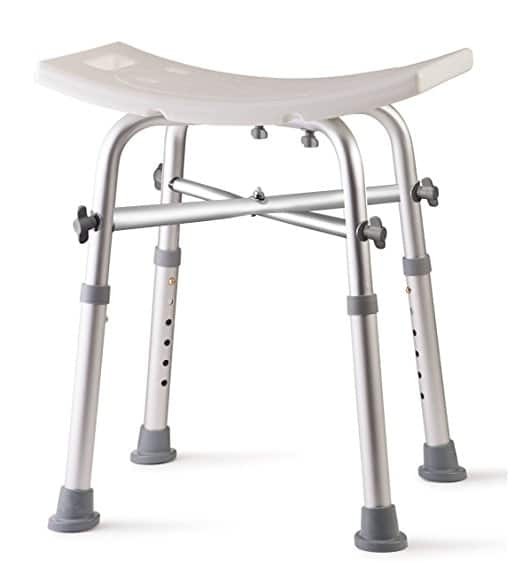 They’re also robust enough to lean on if you have difficulty standing up or sitting down. The chassis is made from sturdy aluminum and it is safe to use up to 330 pounds. The dimensions of the seat are 33” by 19.5”. You can adjust its height up to 25.5”. You can easily clean the water-resistant PU seat, backrests and armrests. If you need help getting into your tub, this chair may be the best option for you. The extension kit makes it perfect for any bathroom, and the chair is designed to save space. If you have vision problems, it could be a good idea to get the bright blue model of this chair. Some users dislike the thought of keeping medical equipment in the bathroom. If that is the case for you, you may want to get the EcoDecors Eleganto Shower Stool. 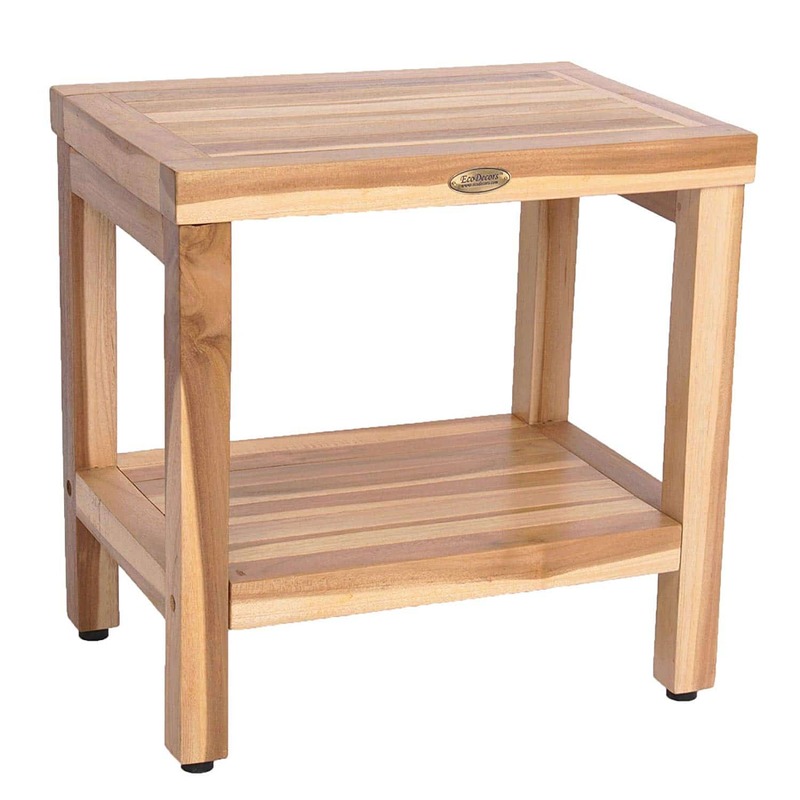 This shower stool is made from plantation-grown teak. This wood is very popular among shipbuilders, as it is water-resistant and also mold and mildew. EcoDecor upcycles teak items and creates attractive furniture with an all-natural look. The stools are produced in Indonesia and re-inspected for quality when they enter the US. It’s also worth noting that the manufacturing process of this shower stool is environmentally-friendly. If you like the thought of supporting a US-based family business that protects the environment, this could be the best option for you. The teak is properly coasted so you never have to worry about drying it off. However, it’s a good idea to avoid leaving soap or residue on the surface of the stool. This stool weighs around 15 pounds, which may be too heavy for some users. Its height and width are both 18 inches, and the seat depth is around 14 inches. This compact shower stool can safely support people who weigh up to 250 pounds. It is also unlikely to slip around on the surface of your shower. What is the best aspect of this stool? It comes with foot levelers that you can use to adjust the height. This means that you can use this shower stool on an uneven floor. If a leg seems wobbly, you can even the feet out with the built-in levelers. Are you looking for an elegant-looking shower stool you can set up safely in any bathroom? If so, the EcoDecors Eleganto might be the right option for you. However, stools aren’t comfortable enough for some users. Here is a simple but very practical bath seat. It comes with a back rest and arm rests, but assembling and disassembling it is very easy. Since it only weighs 7 pounds, this is easy to move around. The NOVA Bath Seat is made from rust-proof aluminum, and it has a weight capacity of 300 pounds. However, the seat dimensions are 15.75" (width) x 13" (depth), which may be too narrow for some users. It is a good choice for both bathtubs and showers, as you only need a level space of 21.5" x 19" to use this chair safely. The arms are 19.25 inches apart. We like that you can adjust the height of this chair (16” to 21”). Adjustment is simple and doesn’t require any tools, and you can choose between six different heights. The chair is both very durable and designed with your comfort in mind. It’s made of robust, blow-molded plastic, with seven drainage holes to get rid of the water around you. The aluminum is rust-proof. If you’re looking for a flat seat, this chair might be your best option. The padded armrests and the backrest are sturdy enough to hold onto when you’re sitting down. The aluminum legs come with skid-proof rubber tips, which guarantee that this chair will stay in place when you’re using it. The rubber feet come with drain holes as well, so you don’t have to worry about water gathering in the legs of your chair. This chair only has one downside. Although the legs are set at an angle, it might not be stable enough for users who have balance issues. If you want a comfortable, reasonably priced, and durable bath and shower chair, you may want to go for this NOVA product. This chair has a capacity of 300 pounds, and the height can be adjusted to your needs. Finally, let’s consider another bath transfer bench. This one has a swivel seat that turns 360 degrees, which means you can easily switch between left-hand-side and right-hand-side positioning. You can clamp the entry side of this bench to your tub wall. It’s worth noting that the clamps won’t work on rounded tub walls. This design saves space, so we recommend it if you have a smaller than average bathroom. Additionally, you won’t have to worry about getting your bathroom floor wet even without a shower curtain. The sliding rails of polished aluminum tubes are very durable. 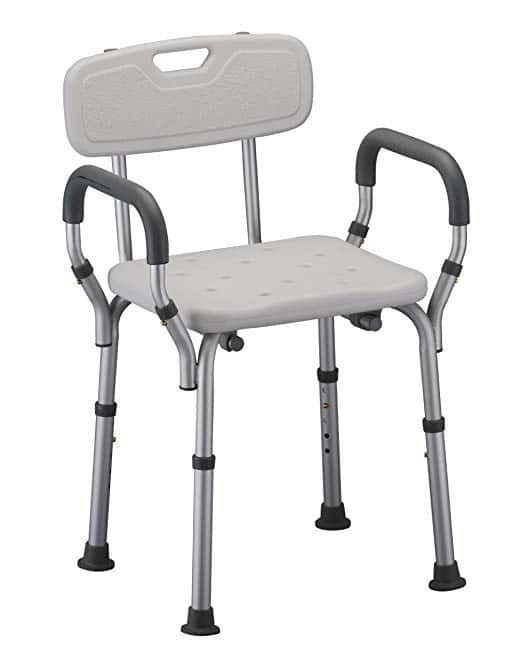 The Eagle Health Supplies bath chair is sturdy enough to seat a person weighing up to 350 pounds. It comes with specially designed sliding rings, which means that you may be able to use it without assistance. The sliding distance for this chair is 6.75 inches. While the molded plastic seat isn’t entirely comfortable, this chair comes with a curved backrest. Since the plastic has a textured finish, you won’t have to worry about slipping from it. There is a seatbelt for extra security. You also won’t have to worry about water and soap pooling up around you, as there is a drainage system on the seat. This bath chair is a worthwhile investment for people who need some extra help with entering and exiting the bathtub or shower. It’s made of durable, heavy-duty materials. The size of the seat is 17.75" x 14.75". But what about the height of this chair? Your height will be five inches above the height of the tub walls. There are different leg sizes you can use, depending on your tub’s dimensions. Since the policy is that you can’t return the chair after you open the box, you might want to check in advance if the chair fits the tub. We recommend this transfer bench to anybody who is looking for a long-term solution to getting in and out of the tub. It is a sturdy and relatively affordable transfer bench that is very easy to use. Getting the right bath and shower chair can make a considerable difference in your life. This is why you should take the time to choose a chair type that fits your needs. Here are a few questions you should ask before you invest in a transfer bench or another type of bath and shower chair. What is your current mobility level? Will it change over time? People who have a relatively good sense of balance can opt for shower stools. Others need to choose chairs that have a backrest and armrests. Transfer benches are a very good option for people whose mobility is more impaired. Will you be using the chair alone or with assistance? Getting the right bath and shower chair may let you go back to using the bathroom without assistance. For independent use, you want an extremely sturdy chair. Lightweight chairs are also useful in this case. Are you planning to take the chair with you when you travel? Portability is an important concern for some users. If you’re planning to take your chair with you on trips, make sure it’s compact and easy to assemble. Is the chair design appropriate for your bathroom? It is very important to take your bathtub or shower’s dimensions into account before you invest in a chair. Do you need a chair you can use on an uneven floor? Some shower or bathtub floors aren’t perfectly level. Take this into account when you’re looking for a chair. Now, let’s look into some of the specs that you should pay attention to. Make sure to get a chair that can comfortably seat a person of your body weight. Bariatric chairs are available for people who have a heavier build. Your feet need to be flat on the floor. Your hips should be either level with your knees, or slightly higher than the knees. This position is both safe and comfortable. If you use crutches or a walker, this might be the best height for you. You should either make sure to buy a chair that fits your height, or you should look into adjustable chairs. Some bath and shower chairs aren’t height-adjustable, so you have to check the dimensions carefully before buying. On the other hand, it’s also important to look into the adjustment mechanism before you get an adjustable chair. Will you need tools to change the height? Is the chair fully stable at all heights? If you’ll need to move the chair around, it’s a good idea to look for lightweight models. However, you should never compromise on stability and safety. Of course, some chairs are meant to stay in one place. In the case of transfer benches, weight isn’t a significant consideration. For the most part, aluminum is the material of choice for the chassis of bath and shower chairs. This material' makes the chairs easy enough to lift and non-corrosive in the bathroom. When it comes to the seat, there are a few different considerations to keep in mind. First, is the seat comfortable to sit on? Some users can’t easily use molded plastic seats. However, it’s possible to find support cushions for this purpose. Secondly, you need to make sure that the seat isn’t slippery. Look for a textured surface and an ergonomic design. All bath and shower chairs are equipped with drainage holes, but some may be better than others at eliminating pooling water. It’s also important to opt for a seat you can easily clean. Polyurethane and other plastics are appropriate for this, but wood chairs aren’t always ideal. You can find bath and shower chairs at any price from around $20 to hundreds of dollars. If you’re recovering from surgery, it makes sense to look at affordable chair models. For people with permanent mobility issues, bath and shower chairs are a more long-lasting investment. Who Use Bath and Shower Chairs? These chairs are used by a wide variety of people. Your doctor may recommend buying a bath and shower chair if you’re recovering from an injury. On the other hand, they’re also widespread among elderly people, as well as anyone with limited mobility. They are designed to give people more independence and security in the bathroom. Some people can avoid moving into a nursing home by investing in one of these chairs. Even the most expensive bath chairs are more affordable than renovating your bathroom. They can be more comfortable than a walk-in shower. Every year, 3 million older people become victims to a fall. Head injuries and hip fractures are common, and they can lead to hospitalization. Investing in a bath and shower chair is a good way to prevent this from happening. Whatever the source of your mobility problems, these chairs can help you keep safe. There is another very important upside to having a good bath and shower chair. A bath or shower can leave you feeling refreshed and it can also improve your mood. But you can’t fully relax if you worry about slips and falls. If you get the right bath chair, you can start every day on a high note.